Vertrek vanuit de haven van Civitavecchia voor een sightseeingtour door de levendige hoofdstad van Italië. Verken Rome en het nabijgelegen Vaticaanstad per busje en passeer hoogtepunten zoals het Sint-Pietersplein en de Sint-Pietersbasiliek, het oude pantheon van Rome en de geliefde Spaanse Trappen. Bezoek de bezienswaardigheden op de Capitoline, inclusief het Senatoriaal paleis en het door Michelangelo ontworpen Piazza del Campidoglio, en sluit af met een stop bij het Colosseum - het grootste amfitheater ooit gebouwd. When we got off the boat, we had to take the shuttle to the meeting place and we met a lovely young woman with a sign with our name. She took us to our driver - Michael. He was great. He asked what we wanted to do and if we wanted to see the vatican. Since we said yes, and it was a Wednesday, he called to see if it was open in the morning. Since it was, we went there first. This was our only snafu. I had written in advance to see if I should get advanced tickets to anything but the response was that they would help us with any tickets we needed. I would recommend getting tickets in advance for what you want to do - although make sure your group is large enough that you won't be grouped with another group - otherwise that won't work well. I wish there was better communication around logistics. They recommended a tour guide so we could miss the line. Great suggestion - we thought. We met the tour guide at 10. She gave us an overview, then 2 more small groups joined and we listened to the overview again. We bought tickets, and about 10 more people joined the group. By the time we actually headed into the vatican, it was 11:15. For one hour and 15 minutes,we could have stood in line, paid less and seen it on our own. We ended up leaving the group and going on our own anyway because it was taking way too long. That was our only disappointment. On the way back to the meeting point, we did get separated because it was too long of a walk for my mom. However, Michael helped us connect and we diverted a disaster there, and Michael was great. We then headed to lunch which was spectacular. Michael suggested a great restaurant with amazing food. Then, we headed to some highlights. The only thing we didn't get to do was go into the coliseum which my boys really wanted to do, but we spent so much time at the vatican we ran out of time. We did see the trevi fountain, ruins, and a lot more stops that were fabulous. I would recommend. We had the most perfect day thanks to our driver MIHAIL. He knew all the best places to visit, was knowledgable and most of all, respected our schedule. Do not hesitate to book your excursion with him. You will NOT be disappointed. We had a driver and a guide. The driver got us everywhere that we wanted to go, a lot of places for just one day. Our guide was not very informative. He showed us the entrances and came to meet us at the exits but he did not seem very knowledgable about the sights. Excellent tour! Mihail was a great guide. Our family of four including a 16 year old and a 5 year old truly enjoyed the tour, and were delighted with the extras. For example, our guide pointed out and walked us to a wonderful restaurant where we ate the best pasta and pizza in the world! He went out of his way to please us, and was very informative. The guide was prompt, and the car was immaculate. I recommend this without reservation. This was well worth the cost. I have been too Rome several times before but have never seen so much as I have on this trip with my wonderful guide. Knowledgeable Punctual, pleasant and always went the extra mile to assist us. I would strongly recommend this guide and using Viator in the future. Price was good, reasonable and i certainly got our moneys worth. This was the best tour I have every taken through Viator and cannot recommend it more highly! The guide catered the tour to fit our needs taking us to the catacombs, all the main tourist points in Rome, and several sites he recommended that were off the beaten path. I saw more in one day on this tour than I saw in five days the first time I visited Rome. I would highly suggest booking this tour if you only have a short time to visit Rome and want to see some amazing sites! Nick was our tour agent. He made us felt like family. He has strong knowledge detail of all tour sites, locations. Love the real Italian foods. We, unfortunately, did not make this tour because our tour guide left without us when our ship's shuttle was 15 minutes late. We highly recommend this tour. The company in charge, Vittoriale Inc., was very professional. Andrea was on time to pick us up at the Civitavecchia Port and led us to our tour guide and driver Michael. Michael explained us every single detail regarding the places we visited as well as made sure to answer every question we had. 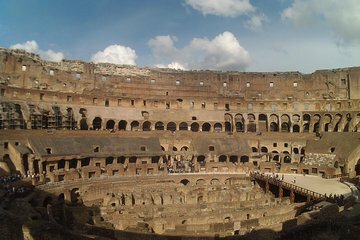 We were able to visit most of the historical places in Rome, such as the Coliseum and various Plazas, as well as the Vatican, one visit I will never forget. Both my wife and me really enjoyed this tour and will book it again in a near future via Viator.